IRL is a long-form confessional poem. In this extended hybrid of monologue, soliloquy, and social media rant, Teebs (as he calls himself) seeks to mercilessly dissect his inner self. The dissection isn’t only inner-directed, but also aimed at the world and how the forces of history, religion, and morality work to overpower the individual. How can he be himself when everyone, either from good intentions or bad, seeks to put him in a box? Yes, Teebs’s queerness and Native American ethnicity make him a unique voice in American poetics. These classifications also have a tendency to turn an individual into a zoo exhibit. Yet it could be worse, since IRL points out even friends and admirers sometimes mistake him for Asian. When Brooklyn hipsterati make these mistaken assumptions, the so-called tolerance and cultural literacy they champion comes across as moral complacency. Throughout the poem Teebs addresses his Muse, usually in annoyance and irritation. He wrestles with his Muse, struggling with his emotions and dealing with how tech-obsessed he’s become. knows I can’t live unoccupied. Beyond the ruminations on his Native American background, IRL has moments of intimate beauty. A rare moment when Teebs is comfortable with who he is. Unshackled by sexual and ethnic taxonomies. But he also addresses these taxonomic classifications, since they are systems he didn’t create for himself. and shake and just Believe. The beauty lies in the circularity of that passage, weaving between the university reading room, his grandmother’s lap, and hearing a raucous party outside. Teebs captures a simultaneous personal revelation and his indictment of the system that sought to annihilate him. Despite the United States promising equal rights, racial tolerance, and economic opportunity to its citizens, Teebs still two strikes against him. Those who romanticize Native Americans are more than comfortable with not seeing them or living close to them. And self-described liberals and progressives can be zealous advocates of LGBTQIA+ rights, but still feel uncomfortable when it comes to a gay pride parade. 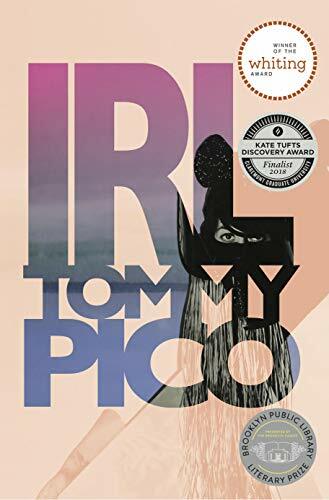 IRL is an abbreviation for “in real life.” Teebs struggles to understand his identity in real life amid the challenges and everyday hypocrisies in modern America. He does so in the heart of the beast, adjacent to Manhattan, capitalist engine of the nation. I’m in the city. Am the city. IRL represents a snapshot of a (self-)tormented poet, a technology-obsessed urban hipster, a lovelorn poet, and a sexual and ethnic minority voice. The poetry is slangy, talky, and bitchy. The poem intersperses Whitmanesque barbaric yawps between bleeding edge pop cultural references. It is of the now, yet it has the potential to become timeless. Is IRL the next “Howl”? Teebs and Allen Ginsberg have their parallels, but is that nothing more than a tease to literary critics? It is too early to tell, since forecasting a poem’s greatness is best left to psychics and prophets. On a more elementary level, Teebs’ long-form confessional poem is a joyous read.